Facebook has maintained its squeeze on sending traffic out to web publishers for another month. The average publisher on the Social Leaderboard lost 0.1 percentage points in social composition from May to June. The most social publishers fared the worst, with the top ten losing an average of 0.6 percentage points month-over-month. Even after losing 1.5 percentage points since May, Wetpaint Entertainment held the top spot on the Social Leaderboard with almost 30% of traffic coming from Facebook and Twitter. The #2 spot was taken by NFL, which climbed three spots on the leaderboard and drew 12% of total traffic from social channels in June. After holding second place for two months, People fell to 4th place, and MTV held steady at 3rd. Each month, we measure social traffic two ways: by composition (percent of traffic from social); and by total volume (number of social visits). In June, volumes also saw a slight decline. Wetpaint fared better than most, adding 100,000 visitors in June and becoming the 11th most social publisher by volume (not counting portals) with 1.4 million social visits. The Huffington Post still holds the top spot in the volume ranking, with 6.5 million social visitors in June. Guess Who Squeezed Traffic Even More? While Facebook traffic to publishers was down this month, Google traffic was down even more. This could be a turning point – the gap between Google’s and Facebook’s traffic contributions to publishers has been widening in Google’s favor since March, but the June results show a reversal of the trend. 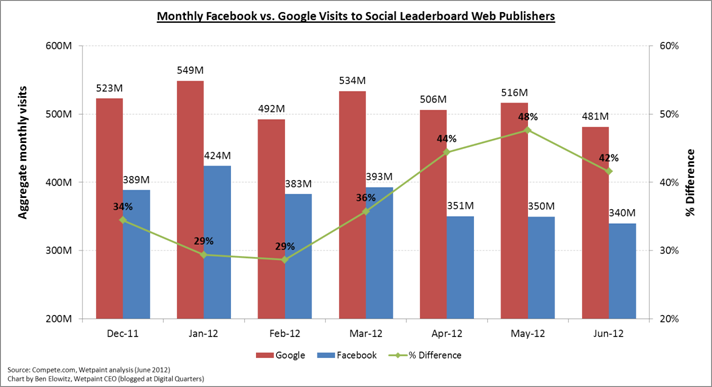 Will Facebook finally close the gap and officially become a more important traffic source for publishers than Google? Check back next month to see if the trend continues.